Decades ago ‘Koeb Mae Tao’ durians were traditionally grown in the Thon Buri area, but have since been on the verge of extinction. Still, ‘Koeb Mae Tao’ durians are now a favourite among many orchard growers due to their luscious and distinctive flavour as well as their relatively small and dry seeds—a sign of a good durian. 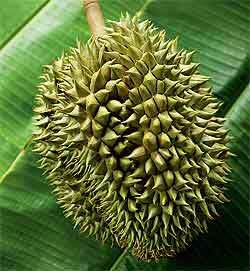 ‘Koeb Mae Tao’ durians generally have thick crusts, sharp spikes, are large in size and have protruding bottoms.